Ford has just released its new-generation Ford Focus. Do you know what that means? It means we’re at a monumental point in history that, while nobody will ever really remember it, could impact you greatly. Because like the automotive equivalent of planetary alignment, we are reaching a moment when Toyota, Mazda, Hyundai and Ford will have all brought their latest-gen small cars to market at about the same time. Okay, you may not find that exciting. But it means you’ve now got the most current technology, styling and safety features to choose from right across the board, with Ford the latest to throw everything it’s got at its new small-car contender. Ford has priced its new Focus competitively compared to rivals like the Toyota Corolla, Hyundai i30 and Mazda 3, but its most affordable grade does kick off at a slightly higher level than the entry-level cars for those other brands. That start point for the Focus hatch range is the Trend grade, with a list price of $25,990. Above it is the ST-Line, which is a sporty spec, for $28,990. And at the top of the hatch range is the $34,490 Titanium. There’s also a wagon version of the Focus in the ST-Line grade for $30,990. But wait, there’s more. Ford is offering an SUV-style version of the Focus for the first time. It’s called the Focus Active, and it’ll cost $29,990. We’ll cover the physical differences between it and the rest of range in the Design section below. Above the $28,990 ST-Line hatch is the $30,990 ST-Line wagon (pictured). Coming standard on the Trend is an eight-inch display screen with sat nav, Ford’s Sync3 voice activated media system, Apple CarPlay and Android Auto, digital radio, a six-speaker stereo, a Wi-Fi hot spot, single-zone climate control, rain-sensing wipers, a rotary-style gear shifter, LED running lights, paddle shifters, halogen headlights and 16-inch alloy wheels. The mid-spec ST-Line takes the Trend’s features and adds dual-zone climate control, wireless phone charging, floor mats, puddle lamps, privacy glass and 17-inch alloys wheels. There’s also the sports suspension, which we’ll cover in the Driving and Engine sections. The top-of-the-range Titanium brings a B&O 10-speaker sound system, heated front seats, leather accented upholstery, roof rails and LED headlights. This new-generation Focus is completely new, and that goes for its design, the structure of the vehicle and the platform that underpins it all. That grille, though poutier than before, still makes this new car recognisable as a Focus, but the rest of the car’s styling is a fairly big step away from the look of the previous model. The nose looks more elongated and turned down, and the headlights have an irregular shape (which somehow works) and they’re helped to look more defined by the LED running lights that sit above each headlight like an eyebrow. That front-end may take some getting used to, but I think most will like the rear exterior styling straight away. The hoisted-up style to the rear of the previous car is gone and the illusion is now a car which sits lower and level. I particularly like the Focus badging across the tailgate, too, which is reminiscent of Fords of the 1960s. The car’s profile has changed, too, with the window structure simplified. Previous versions of the car had rear quarter glass; a small porthole which looked into the boot. That’s now been incorporated into the door glass, which means the rear passenger aperture is larger. Inside, the cabin has been decluttered of its galaxy of buttons, and that busy interior has given way to a more minimalist design with many of the functions moved to the large dash-top screen. That said, the steering wheel still has way too many buttons for my liking or need. The Focus hatch is 18mm longer and 13mm lower than the previous model. Telling the grades apart may not be obvious at first, but the ST-Line car is recognisable thanks to the blacked-out grille, more aggressive bumper treatment with its air-blade style design around the fog lights, and its twin exhaust. The car itself sits 10mm lower on sport suspension. You can pick a Titanium from the inside by its leather-accented seats, multi-colour ambient lighting and the B&O sound system speakers. The ST-Line’s seats are upholstered in a mesh-fibre material with leather accents and red-stitching, and there’s a flat-bottomed steering wheel and metallic brake and accelerator pedals. The wagon version of the Focus only comes in the ST-Line grade, and it comes with roof rails and a cargo cover. The Active grade is the most recognisable of the Focus family due its higher-riding stance and its plastic wheel-arch cladding. The Active suspension has it sitting 35mm higher than a Trend grade, and while that doesn’t seem like much, the overall affect is quite dramatic, giving the Active a true SUV-like appearance. There are nine colours to choose from, including Ruby Red, Orange Glow, Desert Island Blue, Blue Metallic, Shadow Black, Magnetic, Moondust Silver, Metropolis White and Frozen White. At 4378mm end to end, the Focus hatch is 18mm longer than the previous model, while at 1454mm tall it’s 13mm shorter, and it’s 1979mm wide including the wing mirrors. The new Focus is longer by about 18mm, but it’s the wheelbase which has increased the most dramatically (by 52mm) and that means more space inside. I’m 191cm tall and I can just sit behind my driving position without my knees touching the seatback – I wasn’t able to do that in the previous Focus. Headroom is also great for me in the backseat. The entire cabin feels roomy, actually. For this new model the dashboard was moved 100mm further forward, opening up more space in the cockpit. Even the gear shifter being a rotary dial has freed up room. Storage throughout is pretty good, with a deep centre console bin covered by the armrest and a hidey-hole in front of the shifter, plus two cup holders and big bottle holders in the doors up front. The door pockets in the back are big, too, but there are no cupholders in the second row. Boot space is for the hatch is 273 litres packed to the cargo cover, while the wagon’s cargo capacity is 575 litres. With the back row down, the hatch can fit 1320 litres and the wagon can do 1620 litres. The new Focus has been given a new engine! It’s a 1.5-litre, three-cylinder turbo–petrol, but don’t let that put you off – it makes as much grunt as the four cylinder in the old Focus. Actually, at 134kW, it makes 2kW more power and the same amount of torque (240Nm). Cylinder-deactivation allows the engine to run on two when not under much load, which is even more frugal. The old six-speed auto has been replaced with an eight-speed automatic – it’s not a dual-clutch, it’s a traditional torque-converter auto. The Focus doesn’t offer a manual gearbox, and is front-wheel drive. The Active and Titanium grades weren’t available to drive at the Australian launch of the Focus, but I did get to drive the ST-Line in hatch and wagon form, as well as the Trend hatch. 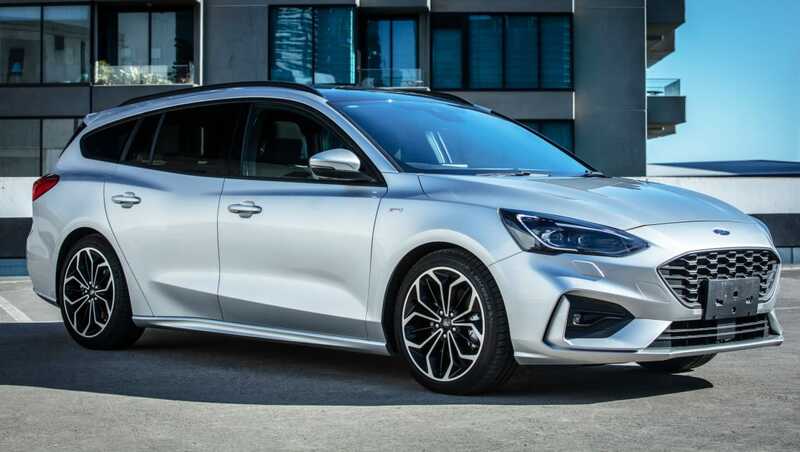 The ST-Line hatch is the sporty one in the Focus range, even though it has the same 1.5-litre, three-cylinder turbo–petrol engine as the Trend (and the Titanium). What makes it sporty is its sports suspension. Does it work? Absolutely, although I didn’t realise just how well until I drove the Trend hatch after steering its ST-Line brother for a few hours first. Three-cylinder engines tend to have a satisfying little burble to their exhaust notes, but the ST-Line hatch I started in had a particularly deep growl to it at idle. While the ST-Line does have a dual exhaust, the engine output is the same as any other Focus, and so the gravelly voice is more theatrics than suggesting the car is any more potent than a Trend. What the ST-Line does do without any drama is handle well, because even though it has a torsion bar set-up in the rear (like the Trend), it also has a lowered ride height and a sports suspension tune. It’s not Focus ST-level of agility by any means, but the ST-Line hatch felt nicely pinned down in the bends, with excellent steering feel and accuracy ensuring it is a genuinely fun car to drive. What I didn’t know until I drove the Trend hatch is that the firmer sports suspension actually gives a more comfortable ride in the ST-Line than the base-grade car. The Trend, like the Titanium, has softer suspension, which you’d think would offer the best ride, but I found that over the bumps and bruises of country roads, the Trend’s ride was comfortable but bit bouncy, while the ST-Line was more composed and meant the occupants weren’t jiggled around as much. The award for the most comfortable ride and best handling of the three cars I drove goes to the ST-Line wagon with its sports-tuned multi-link rear suspension. Yup, the cargo hauler of the range was also the best to drive from a comfort and fun perspective, with its compliant suspension keeping life civilised inside the cabin over bumps, while also feeling planted in the switchback and hairpins that cut through country Victoria. Shifting gears is an eight-speed automatic (you can’t get a manual), but it’s super keen to shift to a higher gear as early as possible, and when sitting at about 100km/h on a motorway, it was indecisive about which gear it wanted to be in; go 104km/h and it shifted up, drop to 97km/h and it shifted down. Up, down, up, down, up… well, you get the idea. When it came time to drive roads which went all bendy, the transmission still tried to take the fun out by shifting up and bogging the car down in lower revs. The solution was to leave the car in Sport mode, which instructs the gearbox to cling to lower gears for longer. I kept the Trend and ST-Lines in Sport mode most of the time I drove them – it didn’t affect the ride (the cars suspension isn’t adaptive), but the throttle response and shifting was perfect for all driving, whether I was flinging through the winding country roads or trundling through town centres. All three – the Trend hatch, ST-Line Hatch and ST-Line wagon – performed well, with the ST-Line duo feeling like they were approaching or even matching Volkswagen Golf levels of agility and composure. At no point did I feel that the three-cylinder was under powered – it’s a surprisingly responsive and grunty engine.